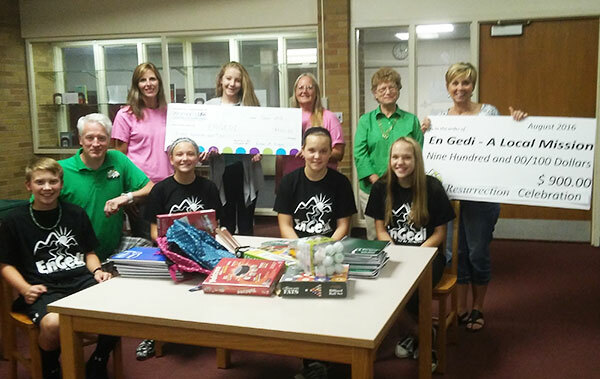 En Gedi, a Christ-centered non-profit Cedar Springs organization formed in 2009 that focuses on building up families in the community, recently received three significant donations from area organizations. En Gedi is funded only by donations typically received at their annual spring auction. However, three area organizations recently provided significant donations outside of the event. Cherryl Rosenberger, a representative of the recently dissolved non-profit Resurrection Celebration, presented a check for $900.00. “The organization’s governing body wanted to give the remaining funds back to our community and felt En Gedi was a perfect fit,” explained Rosenberger. Dena Wever, President of Woman’s Life Chapter 841, noted the local chapter has donated approximately $28,000 to Cedar Springs Area organizations over the last four years. “A matching donation totaling $800.00 is being presented with an appreciation of the En Gedi goals and efforts. Some of our members have had or still have students attending the youth center and have seen the great things happening at En Gedi,” Wever explained. The youth center is offered free of charge to 6-8th grade students Monday-Thursday between 2:15 and 5:30 p.m. on school days. New this year, En Gedi is also open on early release Fridays. An average of 65 students have been attending the program, which provides a healthy snack, tutoring, guest speakers, engaging activities, study and fellowship times, and mentoring. Eighth graders can apply to serve as Assistant Leaders for Pastor Craig Owens, Executive Director of the Youth Center. Four of the Leaders were present for the presentation of the donations, including Casey Fisk, Alex Andringa, Carley Shears, and Maddie Boomgaard. “I am grateful En Gedi provides high school students and adult tutors to assist with homework, if needed,” explained Fisk. “En Gedi is a safe place to be refreshed and relax after a hard day’s work,” added Andringa.